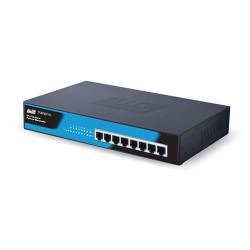 The POEFE8TV3 is an unmanaged, low cost Fast Ethernet Power over Ethernet (PoE) desktop switch, designed to support small density workgroups where devices such as IP Phones require powering from the switch over UTP data cable. Overview The POEFE8TV3 is a desktop switch with 8x 10/100Mbps PoE ports, fully compliant to the IEEE 802.3at and af Power over Ethernet standards. All ports are auto sensing, auto MDI/X, allowing easy connectivity to your existing switching infrastructure and your PoE Powered Device (PD), such as IP Phones, Wireless Access Points and IP Video Cameras. All ports support up to 18.75W of power, with the switch supporting up to 150 watts total power. The switch is powered by an internal power supply. The POEFE8TV3 is the ideal solution for adding low cost PoE capability to support PoE powered devices on smaller networks. The POEFE8TV3 is a model from the POE-ATS Series of Layer 2 Unmanaged POE+ Power over Ethernet Switches.